Spaceborne Differential Interferometric Synthetic Aperture Radar (DInSAR) is a remote sensing technology based on the measure of the phase of a radio wave reflected by ground scatterers. Calculate the phase’s difference of those ground scatterers detected by two radar satellite’s acquisitions in two distinct times allows, in theory, to detect the small deformations of the topography which occurred between the temporal baseline. Limited by atmospheric artifacts and decorrelation problems (changes in electrical properties and moisture of the soil), DInSAR is more effective in urban, arid or rocky areas than in forest or cultivated areas. But it can detect quasi vertical movements covering very large areas in a continuous way. That is why DInSAR can be considered as an efficient tool to detect and monitor slope instabilities. 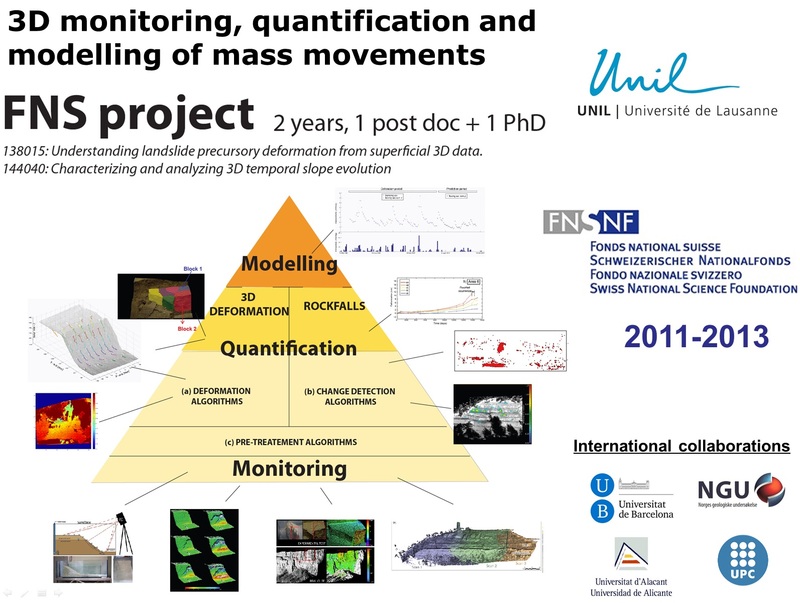 This Master Thesis in Engineering Geology was done in the Institute of Geomatics and Risk Analysis of the University of Lausanne to bring theoretical and technical requirements to use DInSAR technology in studies of slope surface processes. The La Frasse landslide is studied for this work. It is located in the State of Vaud (Switzerland). With a length of 2 km, a larger of 500 m, his surface of rupture is located between 60-10 0m of depth. With high velocities (presently at 40 cm/y in the active lower part), La Frasse’s landslide is in highly hazardous area according to the Swiss legislation. According to Varnes classification, it is a complex slide composed of tertiary flysch material and flowing over flysch and limestone bedrock. The landslide area is occupied by forests, pastures and some habitations. Today, the instability is maintained by the river “Grande-Eau” erosion of the foot. To acquire the Radar dataset, the project « Differential Synthetic Aperture Radar Interferometry (DInSAR) in monitoring large landslide in La Frasse (Vaud, Switzerland) » was concluded with the European Space Agency. To validate DInSAR results, we dispose of data provided by an optical detection of ground movements system, with prisms on the landslide localized every 2h with a Laser station (Robovec™ System, Soil Mechanics Laboratory, Swiss Federal Institute of Technology of Lausanne). First of all, two interferometric pairs are constructed with data provided by the satellite Alos. The large wavelength (24 cm) of ALOS’ PALSAR sensor gives results in the foot of the landslide, where the movements are the most important. Afterwards, fifty-three interferometric pairs are constructed with twenty-two images acquired with the European satellite Envisat. With the lower wavelength (5.6cm) of the Envisat’s ASAR sensor but the higher number of interferograms, the analysis provides the mean velocities on landslide’s scaterrers by using the SBAS methodology. The results of this study are coherent with the amplitude of the deformations monitored by Robovec™. Moreover, the computation of the mean velocities shows that today, total displacements are measured in the active lower part of the landslide; the data complete Robovec™ results. But the accuracy of the measured displacements and the number of scatterers could be improved by synthetizing the topographic phase from an aerial laser scanning DEM instead of the STRM DEM. The number of scatterers can also be increased by installing corner reflectors in the fastest-moving area of the landslide. Real landslides are complex bodies affected by spatio-temporal changes: while some areas are affected by progressive deformation, others areas are typically affected by sudden changes as rockfalls. Use of LiDAR techniques to monitor these complex phenomena is now well established. However, challenge still remain in understanding landslides along 4D (X, Y, Z, time) from LiDAR data, which will lead to a better forecasting of the process. My research focuses on the development and application of new tracking algorithms to quantify the real 3D deformation along slopes. Furthermore, my landslide research focuses on LiDAR point cloud processing and applications such as vegetation removal, registration, semi-automatic rockfall volume computation and covers both analogue scale experiments and real case studies. This research is funded by FNS project 144040 and FNS project 138015 in collaboration with the post-doc researcher Dr. Antonio Abellán. In Nepal, landslides are one of the major natural hazards after epidemics, killing over 100 persons per year. However, this figure is an underreported reflection of the actual impact that landslides have on livelihoods and food security in rural Nepal. With predictions of more intense rainfall patterns, landslide occurrence in the Himalayas is likely to increase and continue to be one of the major impediments to development. Due to the remoteness of many localities and lack of resources, responsibilities for disaster preparedness and response in mountain areas usually lie with the communities themselves. Everyday life is full of risk in mountains of Nepal. This is why mountain populations, as well as other populations living in harsh conditions have developed a number of coping strategies for dealing with adverse situations. Perhaps due to the dispersed and remote nature of landslides in Nepal, there have been few studies on vulnerability, coping- and mitigation strategies of landslide affected populations. There are also few recommendations available to guide authorities and populations how to reduce losses due to landslides in Nepal, and even less so, how to operationalize resilience and vulnerability. Many policy makers, international donors, NGOs and national authorities are currently asking what investments are needed to increase the so-called ‘resilience’ of mountain populations to deal with climate risks. However, mountain populations are already quite resilient to seasonal fluctuations, temperature variations, rainfall patterns and market prices. In spite of their resilience, they continue to live in places at risk due to high vulnerability caused by structural inequalities: access to land, resources, markets, education. This interdisciplinary thesis examines the concept of resilience by questioning its usefulness and validity as the current goal of international development and disaster risk reduction policies, its conceptual limitations and its possible scope of action. The goal of this study is two-fold: to better define and distinguish factors and relationships between resilience, vulnerability, capacities and risk; and to test and improve a participatory methodology for evaluating landslide risk that can serve as a guidance tool for improving community-based disaster risk reduction. The objective is to develop a simple methodology that can be used by NGOs, local authorities and communities to reduce losses from landslides. Through its six case studies in Central-Eastern Nepal, this study explores the relation between resilience, vulnerability and landslide risk based on interdisciplinary methods, including geological assessments of landslides, semi-structured interviews, focus groups and participatory risk mapping. For comparison, the study sites were chosen in Tehrathum, Sunsari and Dolakha Districts of Central/Eastern Nepal, to reflect a variety of landslide types, from chronic to acute, and a variety of communities, from very marginalized to very high status. The study uses the Sustainable Livelihoods Approach as its conceptual basis, which is based on the notion that access and rights to resources (natural, human/institutional, economic, environmental, physical) are the basis for coping with adversity, such as landslides. The study is also intended as a contribution to the growing literature and practices on Community Based Disaster Risk Reduction specifically adapted to landslide- prone areas. In addition to the six case studies, results include an indicator based methodology for assessing and measuring vulnerability and resilience, a composite risk assessment methodology, a typology of coping strategies and risk perceptions and a thorough analysis of the relation between risk, vulnerability and resilience. The methodology for assessing vulnerability, resilience and risk is relatively cost-effective and replicable in a low-data environment. Perhaps the major finding is that resilience is a process that defines a community’s (or system’s) capacity to rebound following adversity but it does not necessarily reduce vulnerability or risk of this community), which require addressing more structural issues related to poverty. Therefore, conclusions include a critical view of resilience as a main goal of international development and disaster risk reduction policies. It is a useful concept in the context of recovery after a disaster but it needs to be addressed in parallel with vulnerability and risk. This research was funded by an interdisciplinary grant (#26083591) from the Swiss National Science Foundation for the period 2009-2011 and a seed grant from the Faculty of Geosciences and Environment at the University of Lausanne in 2008. Andrea Pedrazzini: Characterization of gravitational rock slope deformations at different spatial scales based on field, remote sensing and numerical approaches. Rock slope instabilities such as rock slides, rock avalanche or deep-seated gravitational slope deformations are widespread in Alpine valleys. These phenomena represent at the same time a main factor that control the mountain belts erosion and also a significant natural hazard that creates important losses to the mountain communities. However, the potential geometrical and dynamic connections linking outcrop and slope-scale instabilities are often unknown. A more detailed definition of the potential links will be essential to improve the comprehension of the destabilization processes and to dispose of a more complete hazard characterization of the rock instabilities at different spatial scales. In order to propose an integrated approach in the study of the rock slope instabilities, three main themes were analysed in this PhD thesis: (1) the inventory and the spatial distribution of rock slope deformations at regional scale and their influence on the landscape evolution, (2) the influence of brittle and ductile tectonic structures on rock slope instabilities development and (3) the characterization of hazard posed by potential rock slope instabilities through the development of conceptual instability models. To prose and integrated approach for the analyses of these topics, several techniques were adopted. In particular, high resolution digital elevation models revealed to be fundamental tools that were employed during the different stages of the rock slope instability assessment. A special attention was spent in the application of digital elevation model for detailed geometrical modelling of past and potential instabilities and for the rock slope monitoring at different spatial scales. Detailed field analyses and numerical models were performed to complete and verify the remote sensing approach. In the first part of this thesis, large slope instabilities in Rhone valley (Switzerland) were mapped in order to dispose of a first overview of tectonic and climatic factors influencing their distribution and their characteristics. Our analyses demonstrate the key influence of neotectonic activity and the glacial conditioning on the spatial distribution of the rock slope deformations. Besides, the volumes of rock instabilities identified along the main Rhone valley, were then used to propose the first estimate of the postglacial denudation and filling of the Rhone valley associated to large gravitational movements. In the second part of the thesis, detailed structural analyses of the Frank slide and the Sierre rock avalanche were performed to characterize the influence of brittle and ductile tectonic structures on the geometry and on the failure mechanism of large instabilities. Our observations indicated that the geometric characteristics and the variation of the rock mass quality associated to ductile tectonic structures, that are often ignored landslide study, represent important factors that can drastically influence the extension and the failure mechanism of rock slope instabilities. In the last part of the thesis, the failure mechanisms and the hazard associated to five potential instabilities were analysed in detail. These case studies clearly highlighted the importance to incorporate different analyses and monitoring techniques to dispose of reliable and hazard scenarios. This information associated to the development of a conceptual instability model represents the primary data for an integrated risk management of rock slope instabilities. Murielle Voutaz: Etude d’une déformation gravitaire profonde de versant (DGPV) dans la région du Simplon par une approche structurale et cinématique. Deep-seated gravitational slope deformations (DSGSD) are poorly understood. Induced by gravity deformation mechanisms, the susceptibility of DGPV increases with many factors; the most important are decompressing ice, seismic and regional tectonics. The relationship between regional tectonics and DSGSD is studied in this work through the characterization of morphostructures produced by rock slope failures and DSGSD located on the left bank of Haut-Valais. The direction of these morphostructures was compared with the direction of morphological lineaments of the same area. It shows two main directions of lineaments: NE/SW and NW/SE. The first one corresponds to the direction of the main schistosity, related to the second phase of deformation described by Steck (1984). The morphostructures of rock slope failures and DSGSD show also this direction, confirming the influence of tectonics on this kind of instabilities. The second direction of lineaments can be linked with the expansion phase that occurs in the central Alps from the Miocene. The DSGSD of Wasenalp has developed significant morphostructures: big scarps with a throw of more than 10 m which share the pasture of Wase and two rock glaciers from east to west and counterscarps which induced horst and grabens morphology in the central part of the slope. Significant signs of instability also characterize the toe of the DSGSD including paleolandslides and still active landslides. Three sagging areas are also located on the DGPV: the sagging area of Mäderhorn, the sagging area of Scheen Biel and the sagging area of Hohture. While the first two have only little morphostructures, the sagging area of Hohture shows serious gravity forms, including counterscarps and tensile cracks parallel to the crest line. Besides the study of morphostructures, DGPV analysis was performed on the basis of structural data of the rock mass. This method allowed identifying the orientation of the main schistosity and 6 sets of discontinuities. At least two of the joint sets, J1 and J6, are directly related to the extension tectonics of the area. The measurements of the main schistosity have also revealed a significant flexural toppling in the lower part of the DSGSD. The analysis of the deformation is carried out from the geomorphological analysis and the structural characterization of the DSGSD; several assumptions of deformation were developed to understand the DSGSD. The more consistent one define a deep shearing zone with kink structures which results from the diffusion in depth of the shear constraints from the main scarps. From this scarp the deformation follows first the main schistosity plans and then spread in the shearing zone. The flexural toppling results from the deep shearing zone. Emmanuel Nduwayezu: Rainfall variability modelling and mapping and global risk evaluation in Rwanda. Directors: Prof. Michel Jaboyedoff, Prof. Mikhail Kanevski. The high population densities of Rwanda can be explained by climatic conditions, especially rainfall conditions. Precipitations have been generally quite good, and have contributed to define an agricultural calendar with two harvest seasons in a civil year. With the exacerbation of extreme weather events in recent years and increased flooding events and landslides, what extent of precipitation variability constitute a risk factor to natural hazard for a territory at the limit of its caring capacity (population densities in a mountainous area) with the current conditions of its internal and external factors (physical and socio-economic conditions)?